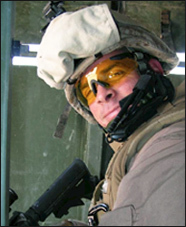 United States Marine Corps Staff Sergeant Rafael Arias Fernandez was severely injured in Iraq on April 14, 2003. While on security duty for a supply convoy advancing toward Bagh- dad, his unit was ambushed by enemy forces. The ambush consisted of small arms fire and rocket propelled grenades (RPGs). He was wounded when the unit sustained a secondary blast from two simultaneously RPGs. He sustained injuries to his head, face, neck, back, and hip. SSG Arias Fernandez was diagnosed with intervertebral disc degeneration, compressed disc in neck, tendon damage to shoulder, hip fracture, hearing loss/tinnitus, PTSD, left shoulder impingement syndrome, chronic foot pain, mild cognitive disorder, sleep apnea, and a traumatic brain injury. His disability rating is 90 percent. Arias Fernandez earned the Presidential Unit Citation - Navy, Combat Action Ribbon, Global War on Terrorism Service Medal, Iraq Campaign Medal (2), Marine Corps Good Conduct Medal (3), National Defense Service Medal, Navy and Marine Corps Achievement Medal, Navy and Marine Corps Overseas Service Ribbon, Navy Meritorious Unit Commendation (2), Navy Unit Commendation, and the Sea Service Deployment Ribbon. SSG Arias Fernandez, wife Aida, and their children were recipients of a home in Homestead, Florida.